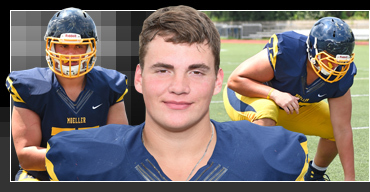 For the fourth consecutive season, big man Zach Carpenter will be fortifying the offensive line for the Moeller Crusaders. A team captain, he has helped anchor the Crusaders' offensive line since he was a 14-year-old freshman. He is one of only a few players in Moeller history to start varsity his freshman year. The honors for Zach started early when, as a freshman, he was named as a second-team MaxPreps' Freshman All-American. Last year, he was named as the Anthony Munoz Foundation Div. I Offensive Lineman of the Year, 1st team GCL-South, 1st team all-city (Enquirer), 1st team SWO District and 1st team all-Ohio. One of the highly recruited lineman in the nation, Zach participated in the prestigious Under Armour All-American Camp in Cleveland and has committed to play collegiately next season at the University of Michigan. "Zach is blessed with incredible strength and athletic ability," says Head Coach Doug Rosfeld. "Zach grew up in a football home, learning the technique of offensive line play. He is blessed with incredible strength and athletic ability. He enjoys the game and studies football with passion." Zach also threw the shot put for the Crusaders his sophomore year. Active in community service, Zach's favorite athlete is JJ Watt, favorite entertainer is Pink Floyd, favorite book is The Bible, favorite movie is A Christmas Story and most-like-to-meet is Bill Belichick. COACH'S QUOTE – "Zach's style of play is a great combination of talent, toughness and technique. He has grown into a fantastic leader in our program and has taken on every challenge thrown his way. I am very proud of the man he is and the football player he is becoming."